Prime Minister Narendra Modi on Wednesday invited Spanish firms to invest in India whose strong economy offers ‘many opportunities’ for them in various fields as the two countries signed seven agreements and vowed to strengthen their cooperation in the fight against terrorism. 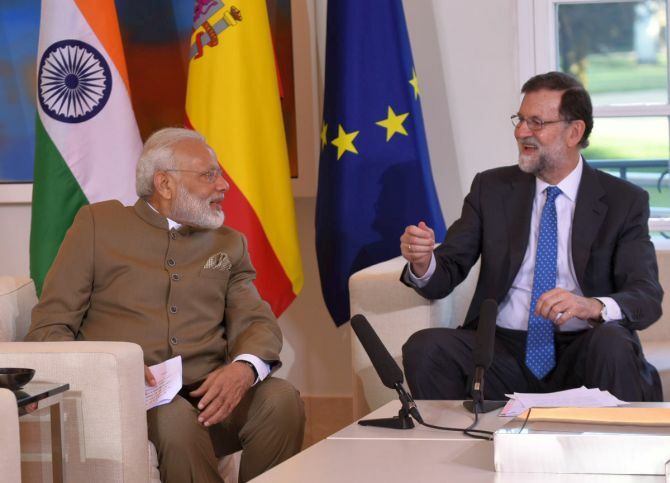 Modi, the first Indian prime minister to visit Spain since 1992, met the European country’s top leadership and said India and Spain maintain close and cordial relations and he sees great potential in this collaboration. The prime minister held wide-ranging talks with President of the Spanish government Mariano Rajoy at the Moncloa Palace on Wednesday morning in the first engagement during his stay Madrid. After the talks, the two sides signed seven agreements, including pacts on transfer of sentenced persons and visa waiver for holders of diplomatic passports. Five MoUs were signed between the two countries on cooperation in organ transplantation, cyber security, renewable energy, civil aviation and one between India’s Foreign Service Institute and Diplomatic Academy of Spain. Spain is the 12th largest investor in India and the seventh largest trading partner in the European Union. There are more than 200 Spanish companies in India that are actively involved in road construction projects, railways, wind power, water desalination, defence and smart cities. There are more than 40 Indian companies in Spain, in the fields of technology, pharmaceuticals, automotive and energy. Two-way trade totalled $5.27 billion (Rs 34,255 crore) in 2016. Modi encouraged Spanish infrastructure, tourism, energy and defence companies to invest in priority sectors in India, saying ‘it’s a great time for Spanish companies to invest in India’. External Affairs Ministry spokesman Gopal Baglay termed the meeting a ‘fresh impetus to a multifarious relationship’. Modi also called for boosting bilateral cooperation to fight terrorism as ‘both our countries have faced the security challenge’. Spain, the summer holiday destination of Europe, in a recent government report said that the Islamic State group ‘has been publishing in Spanish, which means an increase in the risk of its influence on radicals living in our country’. In ‘today’s global context’, Modi said, the focus of his discussion in Spain will be on the international developments. IMAGE: Modi with Spanish President Mariano Rajoy at the Moncloa Palace. The prime minister praised the Spanish president saying under Rajoy’s leadership the country has undergone economic reforms ‘which is also the biggest priority of my government’. He said railways, smart cities and infrastructure sectors were the priority areas for India and Spain has ‘enough skills and mastery’ to contribute to India's requirements. Modi said he is confident that his visit to Spain will give a new momentum to bilateral ties. Later, he paid a courtesy call to Spanish King Felipe VI at Palacio de la Zarzuela palace on the outskirts of Madrid. ‘A royal greeting! 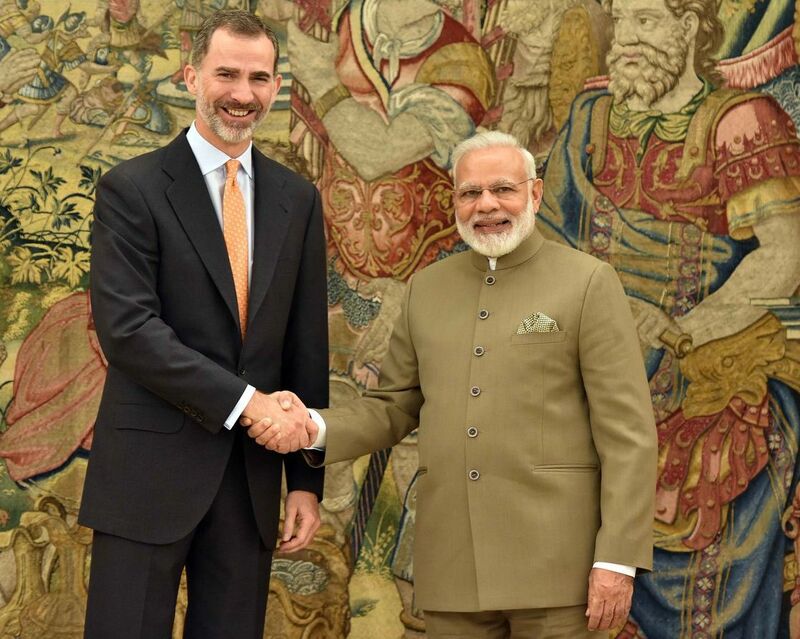 PM @narendramodi calls on His Majesty King Felipe VI of Spain at Palacio de la Zarzuela,’ Baglay tweeted along with photographs of the two leaders. In an interview to Spanish daily Expansion, Modi said the strong economic growth of India offers many opportunities for Spanish companies. He said that there are already a large number of Spanish companies in India and his government wants more firms to come, invest and do business in the country. “Spanish firms enjoy a worldwide reputation in various fields, such as infrastructure, defence, tourism and energy. These sectors have also been identified by my government as priority sectors,” he said, adding that there are many complementarities in economic terms between the two countries. “There are synergies between the experience and priorities of both countries and numerous possibilities for additional investments,” Modi said. “I see many complementarities between my government’s flagship initiatives, such as Make in India, and Spain’s experience in defence, transport infrastructure, high-speed trains, water and waste management and technologies. I encourage Spanish companies to take advantage of these opportunities,” he added. Modi said he was personally committed to helping foreign companies set up operations in India. “We should also increase cooperation in the strategic field in areas such as cyber security, maritime cooperation and defence,” he said. Recalling his meeting with Spanish President Mariano Rajoy in November 2015 on the sidelines of the G20 summit, Modi said he has ‘a great interest in promoting the talks and drawing together an ambitious road map for a greater bilateral commitment between India and Spain’. 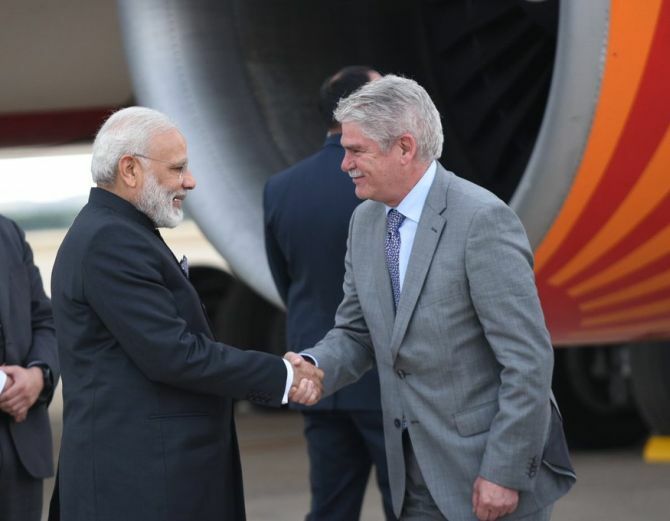 From Spain, Modi will travel to St Petersburg in Russia on June 1 where he will hold the 18th India-Russia annual Summit with Russian President Vladimir Putin and attend the St Petersburg International Economic Forum the next day. The prime minister will be in Paris on June 2 and 3 where he will hold official talks with newly elected French President Emmanuel Macron with a view to further strengthening India-France strategic ties.